A trio of environmental groups has taken aim at a proposed 250 MW pulverized coal plant near Great Falls, Montana in an effort to block the plant's construction and end federal financing of coal plants for rural electric cooperatives. As reported in May (see previous post), a Depression-era program to help electrify rural areas is still providing low-interest loans to rural electric cooperatives to build new coal-fired power plants. This government program, the Department of Agriculture's Rural Utilities Service, is often the only source of financing for rural electric cooperatives with less than perfect credit ratings and is a major force behind the rush to build dozens of new coal plants in the U.S. These new conventional, or pulverized coal plants spew carbon dioxide, the main greenhouse gas and contributor to global warming. The suit, brought by the Montana Environmental Information Center, Citizens for Clean Energy and the Sierra Club, argues that the USDA's Rural Utilities Service did not consider greenhouse-gas emissions in its analysis of seven coal-fired power plants it is financing across the country, including the 250 MW Highwood Generating Station near Great Falls, according to Northwest utility industry newsletter, Clearing Up (subscription required). In May, RUS agreed to provide 85% of the Highwood plant's $600 million price tag on behalf of the Southern Montana Electric Generation and Transmission Cooperative, an association of small Montana electric cooperatives. President Franklin D. Roosevelt formed the Rural Utilities Service (RUS) in 1935 during the Great Depression to help electrify rural America and the program has continued providing low-interest loans for power plant construction to this day. The lawsuit argues that the program is outdated and is no longer fulfilling it's mission. RUS is currently financing seven coal-fired power plants in Idaho, Wyoming, Missouri, Oklahoma, Florida and Kentucky, Clearing Up reports, totaling 3,441 MW. "While rural communities now generally have access to affordable electricity, RUS still has considerable funds at its disposal to spend in areas that in many cases are no longer rural," the suit says. RUS has provided over $1 billion in low-interest loans for projects serving booming suburbs of Atlanta, GA and Tampa, FL for example, just one sign of how much things have changed since the RUS was created over seven decades ago. The suit alleges that RUS did not consider the impact of greenhouse gas emissions spewing from the pulverized coal plants the program is financing and the impact those emissions will have on global warming. The suit's plaintiffs claim that RUS is therefore in defiance of the U.S. Supreme Court's recently ruling in Massachusetts v. EPA that affirms that greenhouse gases are a pollutant and that "the harms of climate change are serious and well recognized" (see previous post). The Highwood plant alone would emit 2.8 million metric tons of greenhouse gases annually, according to the suit, and annual emissions from two other RUS-financed plants in Missouri and Florida would total 12.5 million metric tons. "RUS has never fully considered how financing coal plants ... contributes to climate change," the lawsuit said. A powerful lobbying force, the National Rural Electric Cooperative Association is fighting to keep the federal financing program intact amidst opposition from environmentalists. The organization recently deployed 3,000 members on Capitol Hill to lobby Congress in support of the program. The Cooperative Association argues that the loans for new coal plants are needed to keep electricity cheap and reliable in rural areas. Federal financing, if necessary, could also be directed to low-emitting, climate-friendly energy sources or increased energy conservation and efficiency, rather than dirty, coal-fired power plants. Tim Healy, CEO of newly public EnerNOC, explains how energy conservation can be a great investment - interview on theStreet.com TV. American Express announced the top 5 project ideas selected as finalists for The Members Project (http://www.membersproject.com/), the unique online initiative that brought American Express Cardmembers together to submit, discuss and rate ideas to make a positive impact in the world. Thousands of Cardmembers from across the country came together to vote, narrowing the field from the top 50 project ideas to the top 25 and now to the top 5. Cardmembers have through Sunday, August 5th to cast their vote for the winning idea, which will be announced on August 7th. As the final voting phase of The Members Project begins, American Express is calling for Cardmembers to register and vote for their favorite project idea. For every Cardmember that registers, American Express will contribute $1 toward the winning idea. American Express has committed at least $1 million to bring the winning idea to life. TOP 5 PROJECT IDEAS* -- "Children's Safe Drinking Water - Four thousand children die needlessly every day from drinking contaminated water. This program aims to address this issue through an innovative and low-cost technology that effectively purifies and cleans water while removing bacteria, viruses, and parasites." -- "Plant A Million Trees - Global Reforestation - From forest fires to rain forest destruction to natural water disasters to overdevelopment, trees are disappearing in vast numbers all over the globe. This plan suggests planting millions of trees where they are needed most." -- "Restore our U.S. National Parks - The United States National Parks and Historic Sites are in disrepair and funding is needed to repair and refurbish. This project aims to provide funding to the landmarks that define our nation." -- "Teachers ask. You choose. Students learn. - This program aims to create a website where public school teachers can request specific educational projects for their classrooms, and individuals can log on to choose which projects to fund, in turn, providing educational tools for students from low-income families nationwide." -- "Wind and Solar for Residential - This project plans to create a small power generating unit that is small and powerful enough to be placed into every residential home. The ultimate goal of the project is to create a community of homes to help generate power for the power companies to use." American Express worked with an Advisory Panel of renowned thought-leaders in a variety of fields to review the top-rated projects, as rated by the Cardmembers, and select the top 50 project ideas. General Electric Co. on Wednesday launched the nation's first credit card with rewards dedicated to reducing cardholders' carbon emissions. The new credit card is part of GE's "ecomagination" initiative, which includes growing research in cleaner technologies to $1.5 billion in 2010 and reducing the company's greenhouse gas emissions. GE executives said the card provides one tool for consumers interested in reducing their impact on the environment. But they stressed that the card should be seen as a "first step." "We don't want anyone to think this a 'get out of jail free' card," said Lorraine Bolsinger, vice president, GE ecomagination, at the card's launch event at The New York Academy of Sciences. Users of the MasterCard credit card, known as GE Money Earth Rewards, will be able to automatically contribute up to 1 percent of their purchases to buy greenhouse gas emissions offsets. Credit card "rewards" will accrue over the course of the year and can be redeemed for emissions credit each Earth Day, April 22. Customers will have the choice to donate all of their rewards or receive a portion in cash. GE AES Greenhouse Gas Services, a joint venture between GE's consumer financing unit and power company The AES Corp, said the offsets will be scientifically verified by a third party. "It sets a very high bar of quality we hope people will embrace," said Kevin Walsh, managing director, renewable energy, GE Energy Financial Services. Bank of America Corp., the nation's largest retail bank, is planning to introduce an "eco-friendly" credit card of its own. That card will let customers contribute to greenhouse gas reduction projects based on how much money they spend. Based on the concept of Biophilia, the instinctive bond between humans and other living systems, COOLER Solutions and Loop are designing workplace solutions which will bring natural systems indoors into the artificial office environment. One product being designed is a workplace composting system, where the compost produced will then be used to feed a container of plants above. Excess compost can be bagged for employees to take home for their gardens or house plants. Currently, organic waste makes up 33% of the waste stream in offices, this means that an office of 25 people produces about 70 cubic feet of waste per year. To give perspective, that amount would fill an average backyard garden shed! While some efforts have been made to divert organic waste from home residences, the majority of offices do not have an effective solution and organic waste gets thrown in the garbage and ends up in landfills. (SAN FRANCISCO) - Pacific Gas and Electric Company announced today it has entered into a 15-year agreement with PPM Energy, a developer of utility-scale wind power projects, to purchase renewable wind energy from the company's Klondike III Wind Project in Sherman County, Oregon. The project will deliver up to 85 megawatts (MW) of renewable energy to PG&E's customers throughout Northern and Central California. "Clean, renewable wind power is central to PG&E's commitment to increase the amount of reliable, environmentally-responsible energy in California," said Fong Wan, vice president of Energy Procurement, PG&E. "Today's agreement further advances PG&E in meeting our renewable energy goals." This is the second major wind project that PG&E has signed with PPM Energy. In 2006, PG&E began delivering 75 MW of clean, renewable wind energy as part of a 15-year agreement to purchase wind power from the Shiloh Wind Power Project in Solano County, California. The Klondike project is currently under construction and is expected to begin delivering electricity later this year. "It is gratifying to have outstanding repeat customers from Washington to California select PPM's newest West Coast project for their clean, renewable energy requirements," said Terry Hudgens, CEO of PPM Energy. PG&E has a long history of developing, generating, and purchasing renewable power. PG&E currently supplies 12 percent of its energy from qualifying renewable sources under California's Renewable Portfolio Standard (RPS) program. Of this amount, approximately 11 percent of the renewable energy is derived from wind. With more than 50 percent of the energy PG&E delivers to its customers coming from generating sources that emit no carbon dioxide, PG&E provides among the cleanest energy in the nation. PG&E continues to aggressively add renewable electric power resources to its supply. In addition to Klondike, PG&E recently announced solar contracts with Cleantech America and GreenVolts, and a 25.5 MW contract with Western GeoPower, Inc. for a new geothermal energy facility in Sonoma County, California. PG&E is seeking regulatory approval of these renewable energy contracts resulting from PG&E's 2006 RPS solicitation. PG&E is continuing discussions with additional bidders that made offers and were short listed in the 2006 RPS solicitation, and just received bids for additional renewable energy in its 2007 solicitation. California's RPS Program requires each utility to increase its procurement of eligible renewable generating resources by one percent of load per year to achieve a 20 percent renewables goal by 2010. The RPS Program was passed by the Legislature and is managed by California's Public Commission and Energy Commission. The United States Federal Energy Regulatory Commission (FERC) announced a proposal to shorten the permitting process for pilot ocean energy projects to as little as six months, according to a news release (pdf) from Finavera Renewable Energy, Inc..
Finavera Renewable Energy, Inc. is a wind and wave energy developer with pilot wave energy projects in the works in Oregon and Washington (see previous post) that will utilize their patented AquaBouy wave energy conversion device (click the image at right for an animation). The proposal made by FERC is for projects five megawatts or less, removable or able to shut down on relatively short notice, located in waters that have no sensitive designations, and for the purpose of testing new hydro technologies or determining appropriate sites for ocean, wave and tidal energy projects. To date, the regulatory process has been one of the primary hurdles to the commercialization of offshore wave energy. Trial projects have taken years to move through the permitting process, taking away valuable time in enacting a technology that shows great promise in reducing dependence on fossil fuels. As part of its proposal, FERC will convene a public hearing on licensing pilot projects in Portland, Oregon on Oct. 2, 2007. Finavera recently began construction of their second generation wave energy conversion device, the AquaBuOY 2.0 wave energy converter. Fabrication of the device is being carried out at Oregon Iron Works in Portland, Oregon. Finavera plans to deploy the test buoy later this year off the Oregon coast (see previous post). Finavera recently received a preliminary permit from the Federal Energy Regulatory Committee (FERC) to explore a 100 MW wave energy project off the coast of Coos County, in southern Oregon (see previous post). The company and it's now wholly owned subsidiary, AquaEnergy, have also been working for several years towards deployment of a pilot-scale (2 MW) wave energy park in Makah Bay off the northwestern tip of Washington state's Olympic Penninsula for several years (see previous post). This sounds like good news to me. Without any buoy or turbines in the water, it is very difficult to both assess their performance and reliability in real-word conditions and to assess and study the potential environmental impacts of wave energy development. Streamlining permitting for small, pilot-scale projects will allow developers to get experience in the water while permitting agencies can gather data and real-world experience on the environmental impacts of wave energy buoys and tidal turbines. Without this real-world experience, permitting agencies are largely relying on conjecture as to the impacts of the first proposed commercial-scale projects, which shouldn't put anyone at ease. The last thing the emerging wave or tidal energy industries need is the equivalent of an Altamont Pass on their hands, which is possible if commercial-scale projects are permitting without first studying the impacts of a few pilot-scale projects. All in all, this is a good sign that the wave and tidal energy industries can move forward with proving both the reliability of their technology and it's environmentally benign nature. Recognizing the state's particular vulnerability to the threats of climate change, Florida Governor Charlie Crist signed three Executive Orders, tackle state's greenhouse gas emissions with a bold, multi-prong approach. House expected to vote on national renewable energy standard amendment in the next two weeks. The message is the same in report after report: The U.S. needs a National Renewable Energy Standard or Renewable Portfolio Standard (RPS) to spur the country's renewable energy market, generate millions of new jobs over the next decade, and lower electric bills for consumers and businesses alike -- not to mention help slow the devastating impacts of global warming. But with progress ‘sluggish' on Capitol Hill — last month's RPS amendment proposed by U.S. Senator Jeff Bingaman (D-NM) to the Senate Energy bill was killed before it could be voted on (see previous post) — it's been left to individual states to set the standard when it comes to renewable energy initiatives (see previous post). Currently, 23 states plus Washington, DC, have implemented an RPS or RES, many of which include solar carve-outs. "In the absence of Federal leadership, the states have really taken the initiative on this issue," said Cliff Chen, a clean energy analyst in the Union of Concerned Scientists' California office, during Solar 2007, the American Solar Energy Society's (ASES) national conference in Cleveland, Ohio. "But we're simply not going to get the high results and efficiency that we all desire unless we see some [long-term] federal support. ...George Bush did sign an RPS in Texas—so there is some hope," added Chen. That hope may come in the form of another Energy bill that will be up for vote later this month on the U.S. House of Representatives floor. Although the bill currently contains no provisions for a National RPS, a proposed amendment is expected to be offered by Reps. Tom Udall (D-NM) and Todd Platts (R-PA), which is based on their bill H.R. 969 requiring utilities to increase their use of renewable energy to 20 percent by 2020. "There are currently 120 cosponsors (out of 435 Representatives in the House) on H.R. 969. To move the RPS forward, we need more cosponsors on H.R. 969 and we need members of the House to support the Udall-Platts RPS amendment when the energy bill comes to the House floor in July," according to a legislation update issued last week by the American Wind Energy Association (AWEA). If an amendment requiring utilities to increase their use of wind, solar and other renewable energy sources is not adopted by the House this month, stated AWEA, it will be extremely difficult, if not impossible, to secure enactment of an RPS this year. The latest report highlighting the benefits of a national RPS was released by ASES last week. Led by energy economist Roger Bezdek, Ph.D., President of Management Information Services, Inc. in Washington, DC, key findings in the report indicate that by the year 2030 the renewable energy and energy efficiency industries could generate up to $4.5 trillion in revenue in the U.S and create upwards of 40 million new jobs. The report clearly states, however, that these figures will only be achieved with the appropriate public policy, including a National RPS, long-term renewable energy incentives, public education and R&D. The report also notes that, combined, renewable energy industries generated 8.5 million jobs and nearly $1 trillion in revenue in the U.S in 2006. Generate more than 185,000 renewable energy jobs nationally by 2020 in manufacturing, construction and other industries. Be a $25.6 billion financial boost for farmers, ranchers, and rural landowners who produce biomass energy and/or lease their land to wind developers. Save consumers $10.5 billion on energy bills through 2020 by reducing demand for fossil fuels and lowering natural gas and electricity prices. By 2030 those cumulative savings would balloon to $31.8 billion. Slash global warming pollution by 223 million metric tons a year, the equivalent of taking 36.4 million cars off the road. The UCS analysis reviewed the impact of the proposed national standard in 20 states: California, Colorado, Florida, Indiana, Iowa, Maryland, Michigan, Minnesota, Missouri, New Jersey, New Mexico, New York, North Dakota, Ohio, Pennsylvania, South Dakota, Tennessee, Texas, Washington, and Wisconsin. You can find a list of co-sponsors of HR 969 by searching for the bill (by bill number) at the Library of Congress' THOMAS database. Let's keep the pressure on and make the most of this chance to move America towards a clean energy future! SustainableBusiness.com today announced its 2007 Sustainable Business 20 (SB20) List: The World's Top Sustainable Stocks. The SB20 list, in its sixth year, consists of 20 public companies that are having an important impact on creating an environmentally sustainable society. The list is presented in the Progressive Investor newsletter, published by SustainableBusiness.com, which tracks sustainable stocks. "Our goal is to create a list that showcases public companies that, over the past year, have made substantial progress in either greening their internal operations or growing a business based on an important green technology, says Rona Fried, Ph.D., SustainableBusiness.com CEO and Editor of Progressive Investor. To choose the 20 companies, SustainableBusiness.com partnered with KLD Research & Analytics, which provided a preliminary universe of 50 global companies with strong "green" initiatives and solid financials. KLD also served as a judge along with five leading green investment analysts to decide on the final list. This year, energy efficiency took center stage. Efficiency offers the least expensive, best economic returns, and most dramatic ways to reduce greenhouse emissions, simply by reducing energy consumption in the first place. Comverge energy-management technologies save enormous amounts of energy by cutting peak demand, while keeping the filthiest fossil fuel plants off-line. Philips has been snapping up market share in LED lighting, advocating for and preparing to stop producing inefficient incandescents. Fuel Tech's technology cleans up the dirtiest fossil fuel plants, and Novozymes, "green chemicals" are keys to industrial efficiency and cellulosic biofuels. REC is the world's most vertically integrated solar company; First Solar is the first public company to produce high volume, low cost thin film solar. Vestas, the world's premier wind company, has maintained its leadership position despite heavy competition. Ormat is the world geothermal leader, and Schmack Biogas is the world's leading biogas plant manufacturer, turning organic wastes into electricity, heat or fuels. For Land Securities, the UK's largest property owner, all new buildings meet green building standards, while it works to incorporate gray water, rainwater harvesting, FSC-certified wood, and Fair Trade/ Organic foods company-wide. Interface continues its climb up "Mount Sustainability," innovating in the materials and processes used to make carpet tiles. Furniture maker Herman Miller, another stalwart sustainability leader, is 63% on its way to achieving its goal of Zero Ecological Footprint by 2020. Canon is making its products smaller and lighter, and has an aggressive target of cutting C02 emissions by 50% by 2010. Nike is using green design principles to transform its products, root out waste and toxics, and plans to be carbon neutral by 2015. Groupe Danone, the world's largest dairy company, is converting more to organic dairy, sustainable agriculture. Its groundbreaking joint venture, Grameen Danone Foods, will create hundreds of jobs by manufacturing nutritionally dense, basic foods -- run on solar and biogas -- to low income populations in Bangladesh. It's a model for 50 plants in India over the next 10 years. The world's largest retailer of organic/ natural products, Whole Foods, and Green Mountain Coffee Roasters, the leader in Fair Trade/ Organic coffee, have been on the SB20 since inception. They are exemplary models all around, and are largely responsible for the mainstreaming of natural foods/ sustainable coffee. Both companies are climate neutral. Chipotle Mexican Grill, with over 600 restaurants, is making waves in the world of fast food by serving free range meats and integrating organic ingredients into its menus. The 2007 Oregon Legislature closed a landmark session advancing clean energy legislation and putting Oregon on the map as a clean energy leader. The Oregon Legislature wrapped up it's 75th Legislative Assembly on June 28th, ending a session that can only be considered a landmark year for clean energy and the environment. The 2006 Elections saw Democrats strengthen their majority in the Senate and squeak out a one vote majority in the House while Oregonians re-elected Governor Ted Kulongoski who made clean energy a top priority of his second term. The Governor and the Legislature certainly delivered this year, passing a slough of bills this session promoting renewable energy generation, renewable transportation fuels, increased energy efficiency and even took an initial step towards addressing climate change. Renewable Energy Standard: Perhaps the most high profile, and arguably the most important, piece of clean energy legislation to pass this session was the 25% by 2025 Renewable Energy Standard legislation, the Oregon Renewable Energy Act (SB 838). The standard enacted by the Act requires Oregon's three largest utilties - Portland General Electric, Pacific Power and Light (PacifiCorp) and the Eugene Water and Electric Board - to acquire at least 25% of their electricity from clean, homegrown renewable energy sources like wind, solar, geothermal and ocean energy by the year 2025. The utilities face interim targets of 5% by 2011, 15% by 2015, and 20% by 2020 as well. Oregon's numerous smaller publicly-owned utilities are required to meet smaller standards of just 5% or 10% by 2025, depending on their size. However, if any of these utilities invest in new coal-fired power plants, they lose their exemption from the full standard and must meet the full 25% by 2025 requirement. Oregon's public utilities had argued that the 25% standard was unnecessary for them, since they relied largely on hydropower to meet most of their load. This provision provides a strong incentive to put their money where their mouths are and stay away from investments in dirty, coal-fired power plants. The Oregon Renewable Energy Act will require Oregon utilities to generate approximately 1,500 average megawatts (aMW) of renewable energy generation by 2025, enough to meet the needs of 1.25 million average Oregon homes. Increasing Oregon's use of clean, homegrown renewable energy sources will also strengthen Oregon's economy, increase the state's energy independence, help hedge against volatile fossil fuel costs and make a major dent in greenhouse gas emissions from the electricity sector. In addition to establishing the Renewable Energy Standards, the Act requires all Oregon utilities to offer their customers a voluntary green power product, extends the public purpose charge on PGE and Pacific Power customers' bills to 2025 and re-dedicates the renewable energy portion of those funds to support small, 'community-scale' renewable energy projects less than 20 megawatts. If you're curious, there's plenty more on the Oregon Renewable Energy Act at the Powering Oregon's Future site. [Full Disclosure: I maintain the Powering Oregon's Future site and am responsible for much of its content. I also worked directly to help pass the Oregon Renewable Energy Act in my position at the Renewable Northwest Project]. Biofuels: Succeeding where it failed last session, the Oregon Legislature also passed a bill promoting the use of renewable biofuels in the transportation sector. The biofuels bill, HB 2210, includes a package of tax incentives promoting the production of biofuels and feedstocks in Oregon. The bill also includes a renewable fuels standard requiring the use of ethanol and biodiesel in gasoline and diesel fuels sold in the state, but only after biofuel production in the Oregon and the Northwest reaches a substantial level, to ensure that the standard will support a local, homegrown biofuels industry. Fuel stations will be required to sell at least a 2% blend of biodiesel in their diesel fuel once biodiesel production in Oregon, Washington, Idaho and Montana reaches at least 5 million gallons per year and a 5% blend once production in the Northwest states reaches 15 million gallons per year. A 10% ethanol blending requirement will also kick in for gasoline sold in the state once ethanol production within Oregon reaches 90 million gallons per year. The bill also directs the state government to use biofuels in fleet vehicles and stationary backup power generators and provides a $200/year tax incentive to individuals who use biodiesel (B99/B100) and ethanol (E85) for transportation and solid biomass from agricultural or forestry wastes for heating. The biofuels bill received very strong support, passing the House 53-4 and the Senate 24-3. Clean Energy Tax Incentives: The Legislature also expanded two popular and successful tax incentives supporting renewable energy and energy efficiency investments. Eventually rolled into an omnibus tax package, HB 3201 , expansions of Oregon's Business Energy Tax Credit and Residential Energy Tax Credit passed with unanimous support in the House early in the session and finally passed the Senate in the final days of the session. The tax bill expands the Business Energy Tax Credit (BETC), which businesses and corporations can claim on investments in solar, wind and other renewable energy systems, energy efficiency investments as well as investments in manufacturing plants used to produce clean energy technologies or components. The credit is expanded from a credit worth 35% of eligible project costs, capped at $3.5 million, to a whopping 50% credit, capped at $10 million. The BETC expansion also includes a new $9,000 tax credit available to homebuilders for solar electric and solar water heating systems installed on new construction single family dwellings. Additionally, the tax bill expands the Residential Energy Tax Credit, available to homeowners who invest in renewable energy systems, efficient appliances, weatherization and other home efficiency retrofits. Homeowners can now claim the credit on more than one investment in a given year, allowing them to claim a credit on both a solar electric system and a solar water heating system installed in the same year, for example. The Legislature also passed two other tax bills aimed at clearing up important problems in the tax code. One bill, SB 819, fixed a problem in the interaction between the Business Energy Tax Credit and Oregon's corporate income tax 'kicker' refund which hampered businesses ability to take full advantage of the credit. The other bill, known as the Solar Teamwork Bill (HB 3488), amended the exemption given on property taxes leveled against the increased property value due to renewable energy investments, like the installation of solar arrays. The exemption now applies to systems installed by a third party on a property-owner's property, as long as that system is a net metering system or otherwise designed to primarily offset on-site electricity use. This provision will help encourage distributed generation for renewable energy by not discouraging building owners from allowing alternative energy systems to be installed on their buildings because of increased property taxes. HB 3488 also directs the Oregon Public Utility Commission to authorize the state's two large investor-owned utilities to provide low interest loans for customers who install solar arrays. Solar on Public Buildings: Rounding out a series of measures that ought secure Oregon's position as a leading pro-solar state, HB 2620 also passed this session and provides that public improvement contracts for construction or major renovations of public buildings appropriate at least 1.5 percent of the total contract price to pay for the installation of solar energy technology, including solar electric, solar water heating and solar space heating systems. It's solar on every public building in Oregon from now on! Energy Efficiency: A bill establishing minimum efficiency standards for a number of additional home and commercial appliances not previously covered by efficiency standards passed the Legislature this session as well. While not including as many appliances as originally hoped, SB 375 will help Oregonians save energy, reducing our energy costs and environmental impacts. Global Warming: Last but definitely not least, the 2007 Legislature passed it's first piece of legislation specifically addressing global warming in Oregon! Originally seen as a long shot, three global warming bills were introduced early this session in the hopes that the large clean energy agenda might move quickly, allowing the Legislature to move on to specifically tackle global warming. In reality, the measures were introduced largely to lay the groundwork for upcoming sessions, and while public hearings were held on the bills, it wasn't expected that they would pass until future sessions. Well, while two bills were indeed dropped after two hearings, as the session neared it's end, it looked like one, the Global Warming Integration Act, just might have some legs and the Act, HB 3543 managed to squeak passed the finish line right before the end of the session. The Global Warming Integration Act codifies greenhouse gas emissions reduction goals (10% below 1990 levels by 2020 and 75% below 1990 levels by 2020) and creates the Oregon Global Warming Commission which will coordinate local and state efforts to halt growth of greenhouse gas emissions. It will also fund a new Oregon Climate Change Research Institute within the Oregon University System. The bill not only passed, it passed with a bipartisan 40-16 vote in the House with moneys fully appropriated to not only fund the commission's activities, but also fully fund the research center. Not at bad ending to a busy session for clean energy advocates and a hopeful sign for the chances of future global warming legislation! Next Steps: In the face of such a landmark session for clean energy legislation - clearly the most significant session for energy legislation since Oregon's electricity restructuring law passed in 1999 - you might be wondering what's left to do to complete Oregon's transition to a clean energy state? First, while the clean energy provisions passed this year will certainly make a major dent in the state's greenhouse gas emissions and help promote a sustainable energy future, work has just begun to specifically tackle climate change. The Global Warming Integration Act is a nice step forward, but far from the end of the road, and the Legislature is likely to consider a cap and trade program and an emissions performance standard, both designed to limit global warming pollution from the electricity sector, when next they meet (perhaps as early as a short special session in early 2008 - the Oregon Legislature normally meet biennially). Additionally, Oregon would probably be smart to follow in the footsteps of other states pushing renewable energy development, including Colorado and Texas, by working to establish renewable energy resource zones and expedite investments in electricity transmission to tap the resources in those zones and bring them to population centers. I hope the Legislature also revisits the two energy efficiency and green building bills that died this session and takes a hard look at how Oregonians can push energy efficiency to the max. Stronger building codes that include advancements in sustainable and energy efficient design would make sense, and there are always updates to appliance and lighting codes that can help us squeeze more out of the same amount of energy. The legislatures of Hawaii and New Jersey both recently passed laws specifying mandatory greenhouse gas reductions, joining California (see previous post) as the second and third states in the nation, respectively, to enact mandatory greenhouse gas laws. 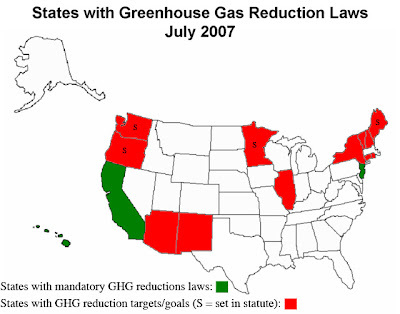 Eleven other states have set greenhouse gas reduction targets and four of them - Maine, Minnesota, Washington and Oregon (see upcoming post) - passed legislation this year setting those reduction targets in state statute, according to this CDM Knowledge Center update on state greenhouse gas laws and actions. The other state targets were issued by governor's executive order. Like California's similarly named law, Hawaii's Global Warming Solutions Act of 2007 (HB 226 CD1), declares that the state shall reduce greenhouse gas emissions to levels "at or below" 1990 levels by 2020, an estimated 25-30% cut over business-as-usual projections and a roughly 15% cut over current emissions levels. The bill, calls for the state Department of Business, Economic Development and Tourism to update greenhouse gas emission estimates for the base-line year of 1990 and to estimate current emissions. It also establishes a 10-member greenhouse gas emissions reduction task force to draft "practical, technically feasible and cost-effective" ways to do achieve the reductions targets by the end of 2009 and appropriates a half a million dollars in fiscal 2008 and 2009 to pay for necessary departmental and committee work. The law specifies that rules establishing greenhouse gas emissions limits necessary to meet the 2020 target must be adopted by December 31st, 2011, with monitoring and enforcement of these rules beginning January 1st, 2012. The bill passed the Hawaii legislature with strong, bi-partisan support, passing by a 48-2 margin in the House and 23-2 in the Senate, according to the Honolulu Star-Bulletin. Jeff Mikulina, state Sierra Club director and a proponent of the legislation, called global climate change "the greatest threat to Hawaii's prosperity" and "truly the greatest challenge of our generation." The Legislature's approval is "making a promise to future generations that we're serious about addressing this critical issue," Mikulina said. Hawaii's Governor Linda Lingle signed the Global Warming Solutions Act of 2007 into law on June 30th, Green Car Congress reports [although I can't find a press release on the signing; the Governor had until July 10th to sign the law, veto it, or let it become law without her signature]. New Jersey's Governor Jon S. Corzine signed a similar greenhouse gas reduction law on Friday, July 7th. The legislation, the Global Warming Response Act of 2007 (A 3301) also sets a mandatory limit on greenhouse gas emissions not to exceed 1990 levels by 2020, a roughly 20% reduction [over current emissions levels I believe, although this could be business-as-usual 2020 levels; the press release is unclear]. The Act also sets a longer-term target of an 80% reduction in emissions below 2006 levels by 2050, making New Jersey the first state to enact a long-term greenhouse gas emissions limit. The legislation tasks the Commissioner of the Department of Environmental Protection (DEP) to work with the Board of Public Utilities (BPU), the Department of Transportation (DOT), the Department of Community Affairs (DCA) and other stakeholders to evaluate methods to meet and exceed the 2020 target reductions. The Department of Environmental Protection is also charged with establishing rules and regulations establishing a greenhouse gas emissions monitoring and reporting program to monitor and report Statewide greenhouse gas emissions no later than January 1st, 2009. DEP will report progress towards the target reductions to the Governor and the Legislature no less than every two years and if necessary will recommend additional actions to reach the targets. States continue to out pace the federal government on taking action against the climate crisis. In addition to these greenhouse gas reduction targets and requirements, 16 states (and two Canadian province) have partnered to develop regional initiatives to cap and trade emissions from the electricity sector. Ten Northeastern states have partnered to form the Regional Greenhouse Gas Initiative (RGGI) which aims to establish a regional program that would cap and then begin to reduce carbon dioxide emissions from the electricity sector 10% below current levels by 2019, roughly the same as 1990 levels and a 35% reduction over business-as-usual electricity-sector emissions projections (see previous posts here and here). RGGI has developed a model rule that partner states can adopt to cap electricity sector emissions and participate in a trading program with other RGGI states. Maine has already adopted legislation authorizing participation in RGGI's cap and trade program, according to CDM's Knowledge Center. 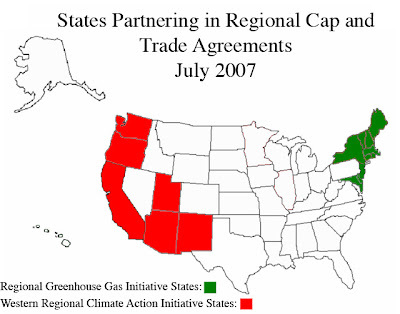 The other states must enact authorizing legislation before the RGGI cap and trade program takes effect on January 1st 2009. While the program initially only applies to the electricity sector, it may be extended to cover other major sources of emissions in the future. Not to be outdone by the Northeastern states, a partnership of six Western states also formed this year to tackle climate change and develop a regional cap and trade program on electricity-sector emissions. Originally launched in February 2007 with five members (see previous post), with the inclusion of British Columbia, Manitoba and Utah, the Western Regional Climate Action Initiative (WRCAI) now includes six Western states and two Canadian provinces, making it an international partnership. Each partner state or province has agreed to identify, evaluate and implement ways to collectively reduce greenhouse gas emissions in the region. The initiative requires partners to set an overall regional goal to reduce emissions, develop a market-based, multi-sector mechanism to help achieve that goal - i.e. a regional cap and trade program - and participate in a cross-border greenhouse gas (GHG) registry. 31 states plus British Columbia and Manitoba launched the GHG registry in May (see previous post). 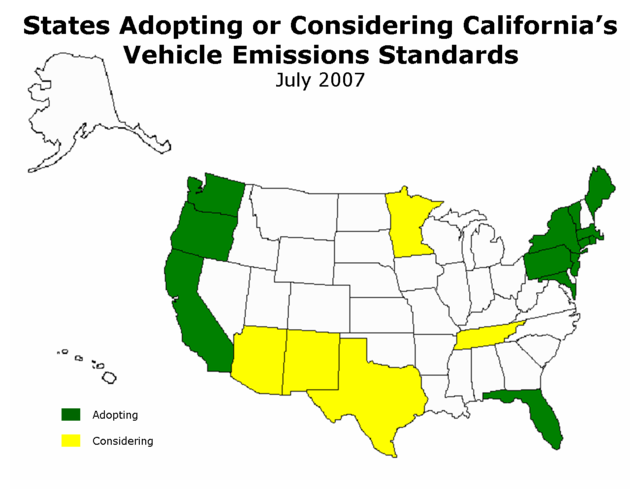 At this point, the WRCIA states lag behind the RGGI states in developing a concrete cap and trade proposal, although with California leading the way, most of the WRCIA states are pursuing or have already enacted renewable energy standards (see previous posts here and here), regulations on vehicle tailpipe greenhouse gas emissions (see previous posts here, here, and here), emissions performance standards (see previous post here) and other policies designed to reduce greenhouse gas emissions from key sectors (see previous post here). It is likely that that WRCIA states will link their carbon market with the RGGI states (see previous post and perhaps with other European countries (see ) participating in cap and trade programs as part of their implementation of the Kyoto Protocol. 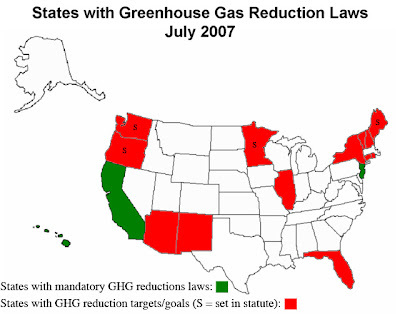 In addition to these actions, 12 states have now adopted California-style tailpipe emissions standards for greenhouse gases (see previous post) and 23 states now have renewable portfolio standards requiring utilities to increase the amount of renewable energy in their electricity mix (see previous posts here and here). While federal climate change legislation is clearly a high priority and will ultimately be both more impacting and likely more effective than a collection of state or regional actions, these proactive state efforts to lead the way ahead by enacting policy solutions to the climate crisis should not be dismissed. As this previous post illustrates, states have emissions footprints as large as many other countries, and their actions are not insignificant. Furthermore, these state actions help drive federal action by serving as 'laboratories of democracy' and create sizable markets that move businesses to develop new products (like efficient cars and trucks). They may also ultimately encourage federal action in another way: by encouraging large business players to push for standardized federal legislation to preempt a patchwork of state policies. There has already been evidence of this phenomenon as business interests are advocating for a nationwide, economy-wide cap and trade policy that would preempt or replace state and regional policies mandating emissions reductions. Congress is expected to take up climate change legislation this fall. MILAN - Pirelli & C SpA unit Pirelli Ambiente said it is setting up a joint venture in the photovoltaic solar energy sector with specialist clean energy private equity fund Global Cleantech Capital. The venture, called Solar Utility SpA, will be owned 50:50 by the two partners and expects to invest 24 mln eur over the next five years to set up photovoltaic plants with 50 MW capacity, it said. Solar Utility will install and own photovoltaic plants for owners of commercial and industrial buildings, supplying them with green energy at competitive prices,' it said in a statement. The venture will sell completed plants to investors, who will be able to get a stable long-term return, supported by government incentives to be handed out over a 20-year period, it said. Italy's photovoltaic industry is growing at more than 30 pct a year and this trend can accelerate in the next five years, it said. Global Cleantech is active in a range of clean technologies in Europe and north America, investing in more than 18 companies in last five years, including Norway's Renewable Energy Corp.
ALBUQUERQUE, N.M.--(BUSINESS WIRE)--ENERPULSE Incorporated has secured $5.5 million in its second round of financing provided by Series B investors, SAIL Ventures Partners and Altira Group, for its consumer launch of Pulstar™ Pulse Plugs, the first automotive ignition device to harness pulse power to improve fuel efficiency, torque and horsepower in today’s vehicles. "We are delighted to have SAIL Venture Partners as a new member of our dynamic team and particularly pleased with Altira's ongoing confidence in our success,” said ENERPULSE CEO, Daniel Parker. Altira previously provided financing for research and development of the Pulstar Pulse Plug. Pulstar is a drop-in replacement for the 1.5 billion spark plugs sold each year. The new ignition technology looks and fits into vehicles like spark plugs, but is 20,000 times more powerful, improving both fuel economy and performance in almost any type of vehicle. "We originally targeted Pulstar to the automotive performance market, but with the high price of gasoline and Pulstar's ability to improve fuel economy, we expect a significant percentage of our customers to be those who are concerned about fuel costs," said Parker. Pulstar Pulse Plugs are currently available for purchase online and in August will be available at select automotive parts stores in the Los Angeles market. Pulstar’s difference lies in its built-in pulse circuit, which stores the ignition's electrical power and then discharges it in an intense plasma ball. In fact, spark plugs can be compared to the low-power output of a flashlight, while pulse plugs generate intense power like the brightness emitted from a camera's flash. "What impressed us the most about this deal is the automotive experience of the ENERPULSE team and how Pulstar can change the paradigm of the 100-year old, commodity spark plug business,” said SAIL Venture Partners spokesperson, Thomas Cain. Can an individual state really make a difference in the climate crisis? Will California,or New Jersey or Minnesota or Washington or Oregon or any of the other states that have taken proactive steps to rein in their greenhouse gas emissions in the absence of federal leadership really have an impact, or are they largely symbolic gestures? Well, the answer to that question will not doubt depend on how effective the policies are, but as this excellent map from Eric de Place (originally posted at Sightline) illustrates, the climate impacts of various U.S. states are the equivalent of entire nations, and state action is clearly meaningful. For each state, the above map shows a nation with equivalent greenhouse gas emissions from energy. Click on the image here to see the full map of the United States. How does your state compare? When I've shown drafts to people, almost everyone wants to compare populations. 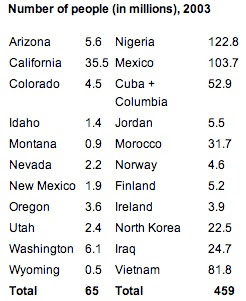 The Western states population comparison is after the jump. The full data are here (xls). I find the full US map a bit overwhelming. Even more so when I realize that the 2003 population of the US - less than 300 million - has the same climate impact as the more than 1.5 billion people represented by the other countries listed on the map. So bravo to those states who have taken the lead on climate policies. And let's keep the pressure on Congress to step it up and enact comprehensive climate change legislation. It's time to do our part, to lead the nation in enacting solutions to the climate crisis. Several states have shown the way; now Congress must follow the path. Solon AG, one of Europe's largest manufacturers of solar energy systems, said today that it has launched a new subsidiary in Tucson to make and install commercial solar-electric equipment. Solon America Corp. will begin making solar energy components at a South Side plant by late 2007 and is expected to ramp up to full production by early 2008, Berlin-based Solon AG said. The company said it is finalizing deals to acquire a 100,000-square-foot facility at 2700 E. Executive Drive, Suite 130, off South Tucson Boulevard south of East Valencia Road. "We are tremendously pleased to be in this historic city, long known for its efforts to make solar power commercially feasible," Olaf Koester, president and CEO of Solon America, said in a statement. The plant will produce high- efficiency photovoltaic modules, which turn sunlight directly into electricity, and provide integrated solar design and installation services to large-scale commercial, municipal and utility customers nationwide, the company said. Solon already owns an interest in a local solar-panel manufacturer. Last year, Solon and a European investor acquired Tucson-based Global Solar Energy Inc., a maker of thin-film photovoltaics, from UniSource Energy Corp., parent of Tucson Electric Power Co.
Solon acquired 19 percent of the company. An unidentified venture capitalist acquired the rest. Global Solar recently purchased a 100,000-square-foot building and 22 acres on the Southeast Side. Global, which mainly makes flexible solar modules for military and consumer uses, plans to move from its current 20,000-square-foot facility at 5575 S. Houghton Road in January. French solar power production company Solaire Direct raised €6.1M ($8,2M) to finance its initial development. Investors include TechFund, Schneider Electric Ventures, and Demeter Partners. The founding team sound like it has the know-how to make a go of it. They need a combination of people able to raise capital and know the solar industry: Thierry Lepercq (Founder of NetsCapital which was a venture fund), Amaury Korniloff (former - Business Development Director of Poweo, an independant power generation company), Stéphane Jallat (ex Industrial Director Tenesol) and Abdel Bounia (ex Engineering Manager Photowatt). Founded just eight months ago, Solaire Direct is the first photovoltaic specialist dedicated entirely to solar energy production in France. The company designs, finances, installs and exploits photovoltaic structures of all sizes from residential installations to ground power stations, it said. German chemicals group BASF and automotive ancillaries and engineering group Bosch have decided to cooperate in the innovative field of organic photovoltaics. Along with pharma company Merck and glassmaker Schott, they have become founding members of a technology initiative of Germany's federal ministry of education and research (BMBF), which will invest in research to expand the applications of solar cell manufacture and reduce their costs. The ministry will provide €60 million for research to develop this market, and the industry up to €300 million. "The initiative to promote organic photovoltaics is an example of how we combine our strengths to invest in new technologies," said Dr. Annette Schavan, German federal minister for research, at the launch of the new initiative. To further develop the new technology, BASF and Bosch are also cooperating on special research activities with the Dresden-based company Heliatek GmbH; each of them is investing €1.6 million in the start-up company, founded in 2006. The other investors are Wellington Partners and the 'High-Tech Gründerfonds'. Heliatek specialises in the manufacture of new-generation organic solar cells. The company is working on an ultra-efficient technology to build large-scale modules on cheap, flexible substrates using a roll-to-roll production process. New investment in renewable energy companies continues to grow solidly, but with a new direction. While ethanol markets seem to be cooling, solar cell markets – particularly those in China – are picking up steam. A sharp increase in the price of corn and concerns about market saturation have threatened ethanol producers’ profits. The market has seen fewer ethanol companies go public this year and more investors shying away from the volatility. Instead, capitalists have turned an eye towards solar power, promising perhaps a brighter, more stable future. "Solar companies, once they're ramped up, they're solidly profitable. This is not the Internet bubble. These companies have real products and real profits." In the U.S., there continues to be a strong, steady stream of renewable energy IPOs. Of the 115 companies that went public during the first half of 2007, eight of them were in the renewable energy sector. That’s compared to just nine offerings in all of 2006.